Mission: The goal of Reston Youth Cheer (RYA Cheer) is to offer quality cheer instruction to youth athletes and work towards building a strong and dynamic youth program that will be long lasting and provide a foundation for upcoming youth interested in cheerleading. Training includes motion technique, stunting, tumbling, jumps and dance. We work towards achieving our mission through committed volunteers, committed parents and committed cheerleaders. Program Summary: We pride ourselves in being Reston’s go to destination for recreational cheerleading. 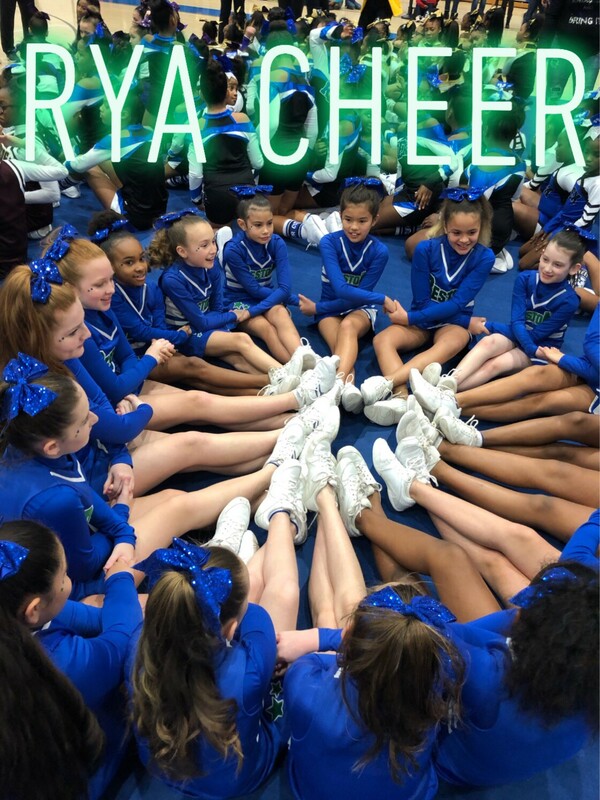 RYA Cheerleading is a team sport designed for girls and boys in K through 8th grade. Participants must be 5 years old by October 1st . No previous experience is required and there are no tryouts to make a team within this program. All that IS REQUIRED is enthusiasm, team spirit, and regular practice to master cheers and chants and build on teamwork. Squads are organized by grade and skill level to ensure team compatibility, safety, and skill development. Spirit/Sportsmanship: RYA Cheer encourages team spirit and sportsmanship by awarding a team spirit award at the end of the season. Spirit means following the rules, Spirit means respecting yourself, your coach, your team and your community. Games: We cheer for home games, playoffs, and championship game within a given season – all home games are played at South Lakes High School. The game schedule is determined once the squads are finalized and after the final weigh-ins (usually the first week of September). A game schedule will be provided once finalize by FCYFL. Events: RYA Cheer participates in several community events including South Lakes HS Youth Night, South Lakes HS Homecoming Parade, Reston Town Center Holiday Parade, Fairfax County Youth Cheer Performance Day and a recreational competition event. Schedule of events to be provided once dates are finalized. Spring Clinic: Did you know that RYA Cheer offers a cheer clinic in April? This initiative offers basic cheer instruction, flexibility drills, and tumbling with a final performance to demonstrate skills. Summer Camp: Summer practice for the fall season begins when Fairfax County Fall Athletic practice begins, usually the first week in August. Practice is held on Tuesdays, Wednesdays and Thursdays during the month of August from 6-8 PM on the basketball courts at Langston Hughes MS (opposite the football fields where the RYA football teams practice). Cheerleaders are required to attend and be on time for ALL practices. Fall Practice: Our Fall practice schedule starts once school resumes. Practices are at least one day per week and are held in the Auxiliary Gym at South Lakes HS. Practices include warm ups, game/side line preparation, stunting, tumbling, and practices for any upcoming events. Cheerleaders are required to attend and be on time for ALL practices.